This rare series was made in chrome in 1952. The satin finish version made in 1953 is extremely rare. Neither version appeared in any Gilbert catalogs. The extremely rare #500 satin finish Combination Car made in 1953. A somewhat less rare chrome version was made in 1952. The extremely rare #501 satin finish Coach Car made in 1953. No chrome version was made; set 5205WCX made in 1952 used the #661 coach. The extremely rare #502 satin finish Vista Dome Car made in 1953. The somewhat less rare chrome version was made in 1952. The #503 satin finish Observation Car is the most rare of the series. It never appeared in any sets. No chrome version was made. 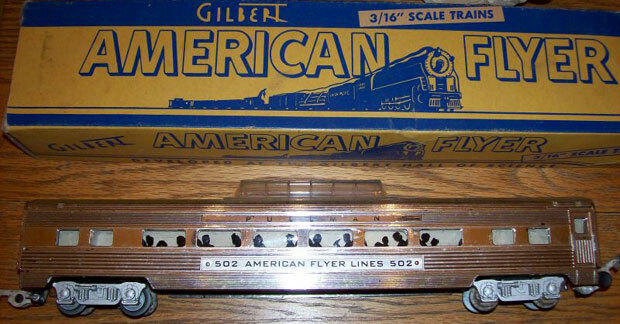 Unnamed set #5434 sold in 1954 comprised the satin finish version of the #500, #501, and #502 behind a #282 steam engine. 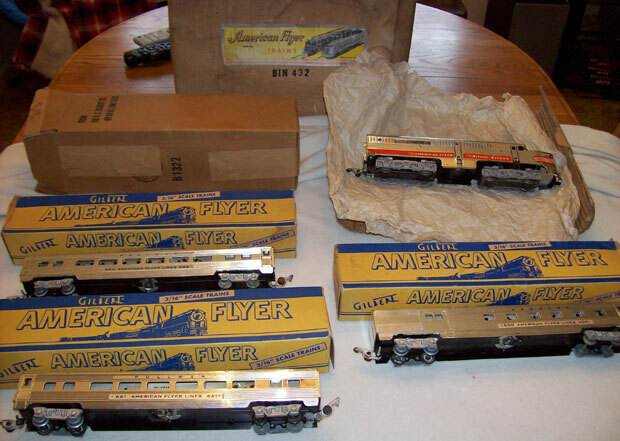 It included 12 #702 Curved Track, 4 #700 Straight Track, #706 Remote Control Uncoupler, #690 Track Terminal, and #1-1/2 45-watt Transformer.